Man's best friend doesn't come cheap these days, so you can imagine how excited a retired Argentinian man was to find double the companionship at a fraction of the cost: two adorable toy poodles—just itching to snuggle, crawl, and slobber all over you—for a mere $150. And by toy poodles, of course, we're referring to preened, fluffed, and steroid-pumped "rats." 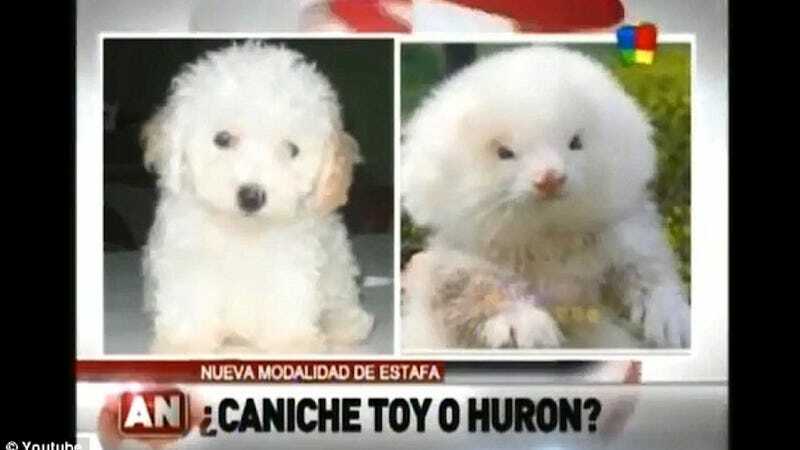 Because since more traditional toy poodles (of the canine variety) can go for upwards of $1,000, one merchant at Argentina's largest bazaar got the brilliant, nightmare-inducing idea to pump a few of what Argentinians refer to as "Brazilian rats" (otherwise known as ferrets) full of 'roids and hair product, pass them off as warped, perhaps inbred poodles, and turn a handsome profit in the process. His creations were apparently at least somewhat convincing, since the man didn't even know anything was awry until his first trip to the vet. But this wasn't an isolated incident. At least one other woman, under the impression of buying a Chiuhuahua, was actually picking up one of these juicing, mutant mutts—although, presumably, with a different hairdo.